Just before the winter chill sets in, is that golden time of autumn; when our world goes warm and toasty and nature mirrors the amber and pink jam-tones of sunshine. The world seems to pause and slow down just a tad, the busy buzz of summer quietens a little and a lulled sway takes its place. We flirt with hibernation as we start to look for ways to make our homes comfortable and warm as we spend more time indoors; not succumbing to winter just yet, we tiptoe between the sunset of summer and the dawn of colder months to come. Our days end sooner and we welcome home time with a new kind of longing at the end of the day. Filled with simple joys and hearty comforts our home celebrates this golden season. The gentle hug of the autumn sun is one of life’s great pleasures, curled up like a kitten on a bed stealing the last slices of sunshine, or tucked up amongst cushions on voluptuous couches while indulging in lazy pleasures such as an afternoon nap, a reading escape or quiet meditation. It is at this betwixt and between time that our home realises the benefits of that which allows equal enjoyment of the indoors and the outdoors. Shutters allow the sunshine and tepid autumn breeze into our homes when welcomed and just as quickly as the temperature changes, shutters seamlessly protect from the biting chill of dark clouds and evening. They also offer great thermal insulation keeping the warm air inside when the outdoor temperature drops. Whether you choose the warm wood tones and earthy natural grain of select wooden shutters or the neutral complementary shades of white and off white, shutters set off the beauty of natural and indoor lighting, transforming it with a simple open or close of the shutter louvres. 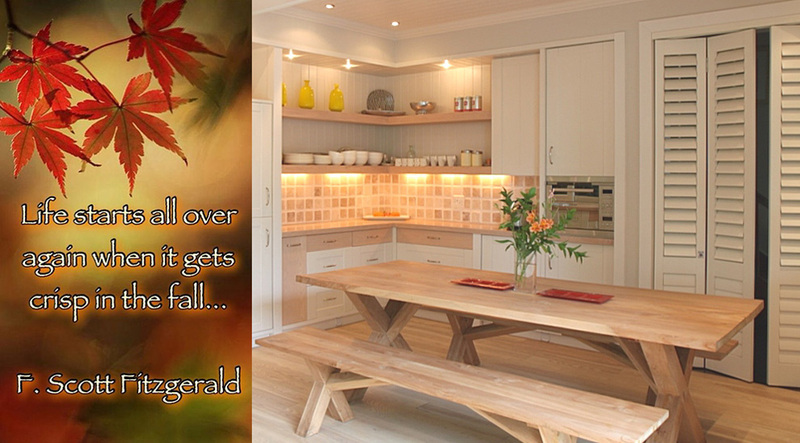 Like F. Scott Fitzgerald said, “Life starts all over again when it gets crisp in the fall…” so why not add something new to your home this autumn and make the most of this golden time.